Laying a stone patio can be done in a number of ways, depending on where you live and what type of patio you need or require, you can choose from a few methods. The good news is laying a stone patio can be done by yourself in a weekend with the proper tools and well planned preparation. Once you have chosen the stone for your project, you must decide how to lay it. If you live in an area that does not experience freezing than you may want to choose a very simple method which is laying the stone on a base of bare ground. This method however is only recommended for walkways and paths and not larger areas such as patios. It is important to choose thicker stones for this application, generally at least 2”thick. With a few simple steps, you should have a patio in no time. 1. Excavate the area to the thickness of the stone that you are using. 2. Lay out small areas at a time to ensure that you are happy with the result. Typically, an area about 3 feet by 3 feet is a workable space. 3. Match the stones to fit and cut each stone one at a time before replacing. 4. Be sure to make the joints as uniform as possible. A space of ½” to ¾” is a good space. 5. Be sure to level the project as you go along using a carpenter level. It is a good idea to tilt the stones slightly in order to have proper drainage. 6. When you are done placing the stones, fill the joints with soil. Mist the area with water, and top up the soil as needed. It is a good idea to plant a grass or ground cover that can withstand a lot of compaction in the joints. If you are looking for a base for your patio that is more stable than soil, or you live in an area that experiences freezing, you will likely want to choose a sand base for laying your stone patio. This procedure is slightly more complicated than the bare ground procedure, but many of the steps are the same. 1. Build forms to contain the sand. Wood makes a good form, and you can leave it in place or choose to remove it, it will look fine either way. 2. You will need a 2” sand base. It is best to use granular sand, and not silica sand. Once you have your sand in the formwork, you will need to level the sand, and then mist it with water to settle it. 3. Lay out the stones in small areas at a time. They fit like a puzzle so you may need to cut them to fit. Cut each stone individually. 4. Reposition the stones and tap them with a rubber mallet until they are approximately a ½” buried in the sand. 5. 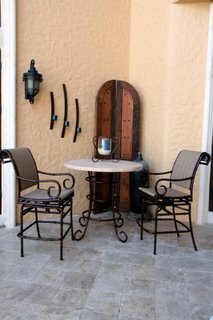 Be sure to level the patio as you go, tilting slightly to allow for drainage. 6. Sweep sand into the joints, mist with water and repeat. If you are looking at laying a stone patio on a concrete base there are a few more steps that you will need to take assuming that you already have the concrete base in place. 1. You will need to choose thinner stones for your patio. 2. Layout the stones, cutting to match and leaving about ½” to ¾” between the joints. 3. Mix concrete to a stiff mixture following the manufacturer’s instructions. 4. Use a trowel to spread a 1” layer of concrete on each stone. Reset the stones on the concrete base and tap into place. 5. Level the patio as you go. 6. Carefully lift each stone and using the trowel, spread concrete butter onto the concrete. 7. Replace each stone and tape into place adjusting for level as you go. 8. Remove any concrete in the joints and wash the splatter off the stones. 9. Let the stones set for 36 hours and then grout between the joints. 10. After grouting, keep the grout moist by misting the patio and let the stone set for a total of 72 hours. This will allow the grout to form a really strong bond. Laying a stone patio can be back breaking hard work. However, a stone patio is a patio that you will enjoy for the rest of your life. In addition, the hard work that you put into laying a stone patio will pay off as you can relax on your beautiful outdoor living space.